Our precast concrete direct burial frost free piers come in round and square and are made from 4000 psi concrete with a 1/2 inch captured bolt provision. Each includes (1) 1/2 inch rerod. Our precast piers are perfect for a variety of uses including but not limited to: Deck Footings, Deck Piers, Foundation Piers, Post Footings, and Camp Foundations. 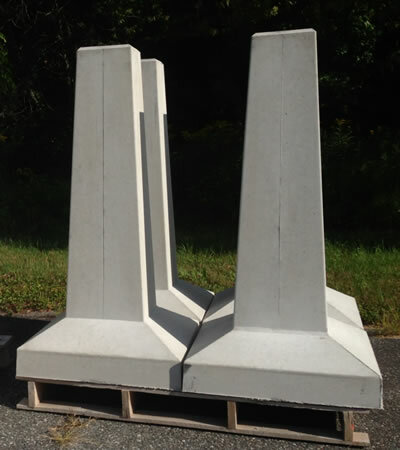 If you do not need a traditional foundation then our precast concrete piers are the perfect Sonotube alternative. Our direct burial frost free concrete piers are tapered and effective at preventing movement due to frost. 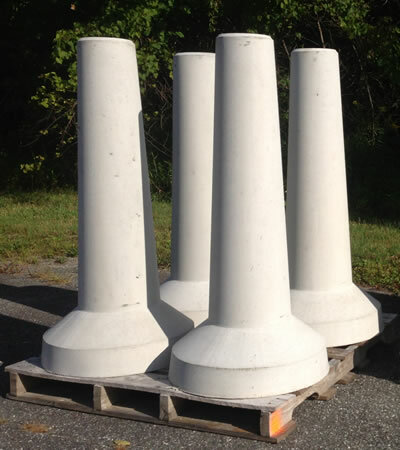 Our round precast concrete piers are available in 4ft and 5ft heights. They have a top diameter of 8 inches and a ground bearing diameter of 23 inches. Want to get that deck done this weekend and don't have time for the concrete to cure... or maybe you just don't like the look of Sonotubes... no problem. Our precast concrete deck footings are a ready to go solution. Come pick them up or have them delivered. Contact Us today! Our square precast concrete piers are available in 4ft and 5ft heights. They have an 8 inch x 8 inch top and a ground bearing measurement of 23 inches by 23 inches. If your application or asthetic requires the look or function of a square column, no problem we have precast direct burial frost free concrete piers in square too. Our foundation piers are manufactured in a controlled environment to the highest quality standard with 4000 pound concrete. Built to last these concrete piers make a great light weight and economical foundation solution for a variety of building needs and a perfect alternative to using Sonotubes.